One day, a few years back I was hankering after some nachos. 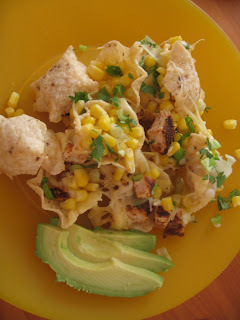 Not just cheese on chips melted in the microwave but Nachos with a capital “N”. The problem was I had no carne asada or beef of any kind for that matter, but nachos I had to have and so, out of necessity, the Nachos were born. Now, I share the recipe with you fortunate souls. Sorry I can’t be more specific about amounts of stuff that’s just not the way I cook. Use as much of whatever as you think looks good, as long as you like it you did it right. Ok, start out by rinsing the chicken and patting it dry. Then put it in a ziplock, laying flat and pound the heck out of it. I like it about half an inch thick, get it as even as you can. You could layer it between two pieces of plastic wrap or wax paper or what ever you like to use for such proceedings but I find that the bag is the best way to avoid chicken splatters all over the kitchen and I am all about that so I use a bag. I give it four-ish minutes on each side. It won’t take long when it’s pounded thin. I turn off the grill at this point but we’re gonna use it again to melt the cheese. I lay the chips out on a jelly roll pan while the chicken is cooking. I’ve been doing half a pan lately because we’ll eat the whole thing if I make it and then we spent the rest of the evening moaning and clutching our exploding bellies. Here’s the chicken ready to come off the grill. 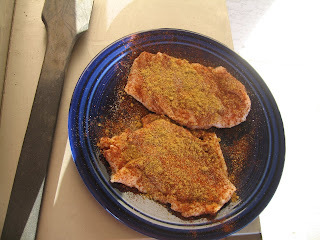 Now, chop it into bite size pieces and spread it evenly over the chips, follow the chicken with bunches and bunches of cheese and get the whole thing back on the grill, the residual heat does a superb job of melting the cheese. 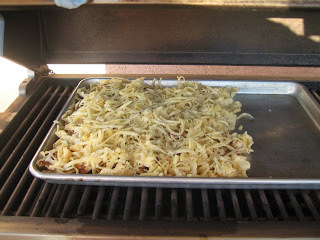 You want to get the pan back on the grill quick though so you don’t loose too much heat. Last time I made these I took my time getting the chicken and cheese spread evenly over the chips and the grill cooled so much it took a long time to do the melting. Here it is tucked in nice and cozy to get all gooey and delicious. While the cheese is doing it’s thing on the grill be sure your frozen corn is cooked and chop the green onion and cilantro. 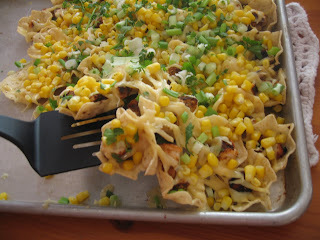 Once the cheese is melted to your satisfaction, distribute the corn, onions and cilantro over the whole thing. Now, for us it’s all done, we put the pan in the middle of the table and go to town. You may like sour cream or salsa or guac with your nachos so feel free to add what ever you think sounds good. I was wishing I’d thought to quarter some grape tomatoes and sprinkle them over my share of the nacho-goodness last night but I wasn’t willing to stop eating long enough to do it. So there you have it, the best part of this recipe? the only thing you have to cook inside your house is the corn. 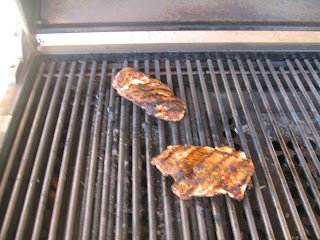 Actually, I think I’ll use the burner on my grill next time, I love a dinner I can cook without heating up the house!